Corfu (Korfu)...The emerald Greek island !! Having decided to visit Corfu (also named as Kerkyra or Korfu), one of the most interesting Greece's islands of the Ioniansea prepare yourself for an unparalleled experience. An amalgam of natural beauties traditional villages & features and archaeological sites. Corfu lies to the north of the ionian sea at the entrance of Adriatic sea. It is the second largest island in the group known as the Ionian Greek islands. This is the island of miracles and wonders, where every moment the scene changes without affecting the harmony of the terrain. The most green of Greek islands, Corfu, has three million olive trees. As well as flower-strewn countryside and Adriatic-style traditional villages, it has splendid coastal scenery and some excellent secluded sandy beaches. On this cosmopolitan island, you'll be able to combine relaxation with good times and a full nightlife, for Corfu is an international tourist centre which can satisfy the demands of the most difficult visitors. Corfu today offers a truly exotic mix of European culture and ancient mystique. Its varied landscape combines alluring beaches and mountain peaks, traditional villages are surrounded by vineyards and olive groves, countless ancient ruins to inspire and stir your imagination. Luxury private villa with pool and amazing sea views across Corfu's west coast. With 3 bedrooms and 3 bathrooms. Sleeps 8 persons. 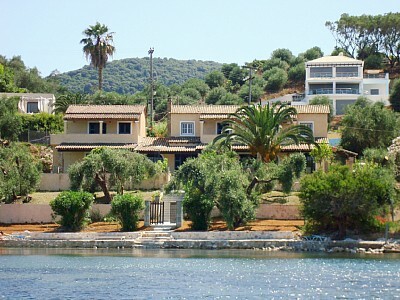 Secluded location directly to beach of Chalikounas. The apts are surrounded by beautiful gardens with palm trees ..
great location in a peaceful surrounding, close to beach, and just 50-00 meters away from the most famous local tavernas. situated direct in the beach and just 5 meters from the sea. This superb villa offers three 3 luxury apartments magical sea views. run by the owner's family, offering genuine hospitality. The studios & apartments are quite & located 100m from the beach. A modern apartments complex, just steps from the Beach and the Sea. Dedicated to the highest standards of Greece's hospitality. Exclusive, traditional Venetian style beach villa Mansion right on the seafront with a unique in Corfu private beach access. The wonderful Corfu island, or Kerkyra for the Greeks... Homer’s beautiful and rich land !! Corfu, Greece: where the British, the French and the Venetians used to live and holiday over the centuries !! Whether you are planning a Civil wedding, Orthodox wedding or a symbolic vow renewal, we are here to design your perfect destination event at one of Corfu's unique and breathtaking locations. Our coordinators will be happy to provide all the information and care necessary to organize the ceremony of your dreams. We have wedding packages to fit every couple’s dreams. Let us guide you as to which one will be most suitable for your special day..
Seeking to invest on Greece ? Looking for an island home or a nice villa? Want to buy a house or plot of land in Corfu. Our team is comprised of helpful professionals including: lawyers, architects, engineers, & developers who are available to assist you. We can suggest and sell individual dwellings, houses, villas or hotels, or we can assist in the purchase of land and the construction of your new home and enjoy the advantages of living on Corfu. The island exerts a certain charm whose source does not only derive from its natural and unequalled beauty. Corfu has a very interesting hostory, a special architecture of its own and a highly developed civilization nd culture. These characteristics can be found all over the island and even in the most remote places. Naturally a lot of concentrated in the island's main Town. There are o lot of places that a visitor should not miss when being in Town. Corfu is the most northerly of the Ionian Islands. The southeast coast lies about 10km from mainland Greece, the northeast about 2km from Albania. Area: 641sq km. Highest point: Mount Pandokrator, at 906m. Length, north to south: 60km. Width, east to west: 4km to 30km. Length of coastline: 217km. Population: 114,000 approximately, of which about 41,000 live in Kerkura Town. About 65 per cent of the island is land is under cultivation. Of this, 55 per cent is devoted to olive trees, of which there are an estimated 3.5 million. The rest of the cultivated area is used for vineyards, citrus fruit, vegetables and grazing. About one million tourists visit the island annually and an estimated third of working population is involved in tourism and its related industries. Climate and weather in Corfu !! The island has a higher average rainfall than the rest of Greece. The highest monthly rainfall is in December, with 240mm. The summer months are almost entirely dry. Average daily sunshine, May - September: 10 hours. Average temperature, July - August: 32°C. Average temperature, December - January: 15°C. Paleokastritsa: The lush green mountains that meet coves of silver sand and shingle makes this resort famous for its breathtaking beauty and magnificent scenery. This is the type of place in Corfu where you will make friends with the locals and be drawn back to its beauty and charm. Retaining a fairly laid back atmosphere, this is the perfect retreat for families and anyone wishing to escape the bustle of everyday life. Why not capture the beautiful views such as those from the 'Bella Vista' on film, or take a stroll up to the Monastery. Days can be spent relaxing on one of the five bays, three of which offer water sports. In the evening, enjoy a meal in one of the local taverns where you can meet friends and try out the Greek dancing. The old Town of Corfu was listed as a UNESCO World Heritage site in 2007. The idea behind the World Heritage list is to help sites of historical or cultural importance to be preserved and protected for future generations to appreciate. The Old Town is cited as a well-preserved example of a fortified Mediterranean port town noted for its medieval and later forts, streets and buildings. The Ancient Greek city at Butrinto nearby in Albania is also on the list and together with Corfu Town these two local heritage sites will help to remind visitors of the historical importance of the region from ancient times onwards. Canal d'Amour and Sidari in Corfu !! Sidari is one of the most popular with tourists regions of the north part of Corfu and its picture-perfect gulf, the Canal d'Amour is a world-famous sight. A beach dotted with small coves and caves that nature has crafted over thousands of years is the perfect location for both romantics and the adventurous. It is said that whoever swims through the canal will find the love of their life at the end of it. The Canal d'Amour has significant history attached to it since a settlement dated to the Middle Stone Age was uncovered there along with ceramic tools of the New Stone Age. The small island "Diaplo" opposite the canal was a prehistoric quarry and skulls and jewelry dated to be 3.700 years old are evidence that this region was prosperous in ancient times. Medieval forts, castles and walls dotted throughout the wider region of the municipality also stand testament to its history. Moreover, boats to the exquisite Diapondia islands - Othoni, Ereikousa, Mathraki - depart from the port at Sidari. These islands are the westernmost borders of Greece.